A.W. Cook Cement, Inc. prides itself on quality, service and innovation. We produce products for manhole restoration, wastewater structure repair, structural concrete repair, decorative concrete, stucco, thin brick mortar, and other blended products. We also offer private labeling and toll manufacturing. 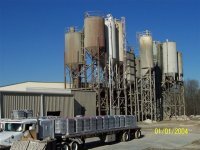 We have an excellent reputation for formulating all types of blended cementitious products for a myriad of uses. If you require a special product for your specific industry please contact us.